Portable Milking Machine for Milking Cows or Buffalos. 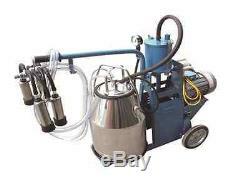 This is an ELECTRIC Piston milking machine. If an ELECTRIC Vacuum Pump model is needed, please check the other listing. Please note that all of the following prices are based on good quality material, the bucket, the base, the muffler, the shelf, the valve adopt stainless steel, the milking bucket is mirror polished inside and outside. Please Specify if you require 60 Hz (North America) or 50 Hz (Europe). Stainless Steel 304 Milk Bucket. Power: 110-220v, 50-60Hz, 0.55Kw. Milking Time: 10-12 cows an hour. Bucket: 25L sus304 stainless steel. Frame Material: 304 Stainless steel, Polish treatment. With ISO9001:2008 certificate and CE Certificate. Factory with over 12 years experience in this field. Excellent quality, reasonable price and great service. Spare parts supplied for one year, with great customer service to help you troubleshoot your machine. Excellent customer service to help you troubleshoot the machine, which is checked before leaving the factory. Any factory defects will be taken care of by us! Oz Tin of Udder Balm to ensure a healthy udder!!! 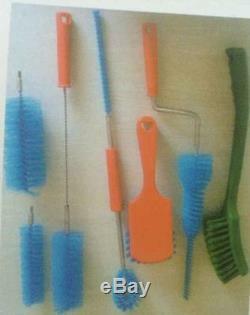 Free Cleaning Supplies Sent with Every Order!! Check out my other items. The only supplier without any hidden costs! The item "Piston Milking Machine for Cows Single Tank+ EXTRAS SHIPPED BY SEA TO PORT-" is in sale since Thursday, May 31, 2018.